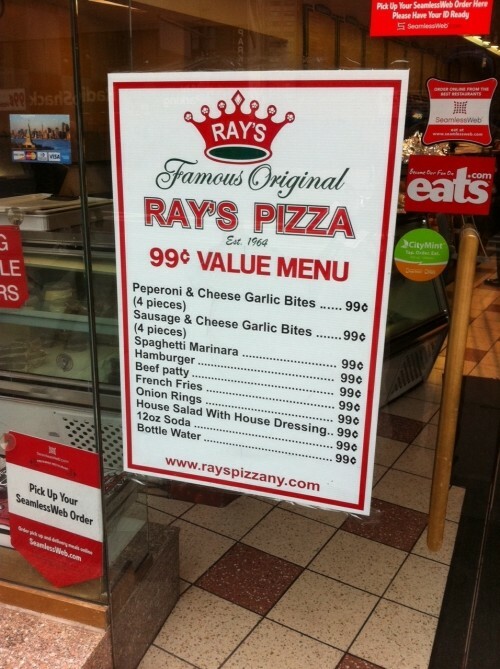 Ray’s between 54th and 55th street on Broadway must be feeling the heat from the recently opened 99 cent pizza shop across the street. They’ve unveiled 75 cent slices and a 99 cent menu. It’s for a limited time only (naturally). Posted by The ML Team at 8:30 am, January 12th, 2011 under Ray's Pizza. Since this is around the corner from my apartment I’ve got 2 comments. #1 – About time. 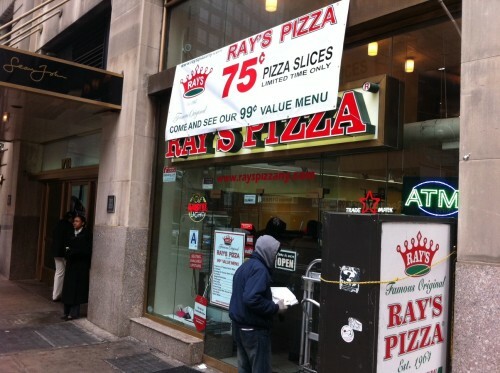 This Rays(and all Rays in the area as far as I know) have refused to sell a plain slice for years. They always made giant, multi-topping monstrosities and charged an arm and a leg for them. The unpinning of the dollar as the world’s reserve currency is coming too. ML will have to raise it’s limit to 15 buck lunches and the lines will be longer at $1 pizza places. They seem desperate. Hope they can keep up the 75c pricing so all the customers win. Too bad it’s not closer to my office. Forget the 75 cent pizza. Lets talk about the 99 cent burger and 99 cent fries. Anyone ever buy a burger or fries from this Ray’s? If its decent, that’s the steal of the century. does the beef patty come with bread, or is that an extra 5.99? I think they’re referring to more of the Jamaican beef patty / pasty thingies. Went to check it out. Here’s what I got. They didnt have any burgers at the moment. I was most impressed with the pasta. Not sure if you can tell from the pic, but the pasta was a very good portion for .99.It could be a lunch on its own for some people. Also loved the steak fries, I was scared they were gonna be some flimmsy thin cut fries. The best quality stuff? Not really. Did it taste good? Yes! Does my stomach hurt now, yes! Haha it was worth it! thank your answering my query. did you see whether they are regular size beef patties? No sorry, I didn’t get to see any beef patties. I don’t know what’s more shocking. That someone would order 99 cent spaghetti (except for the homeless), or that said spaghetti was not incredibly disgusting. Hello Everyone I would like to Thank you all that have commented good and bad. Ray’s has been around for 46 Years. All our food is prepared fresh and with top quality ingredients. Please keep writting comments we will be checking daily all comments are welcomed. Thank you for eating at FAMOUS ORIGINAL RAY’S PIZZA we appreciate your business. Hello, what do you mean by “top quality ingredients?” Does this mean no preservatives are used, dough is prepared in-house daily, meats are pasture-raised and nitrite-free, and produce is organic? Well I guess what I wrote did not made it on. Went to Ray’s this past Friday. Two slices for like $1.63 – can’t be beat. And they even take credit cards for such a small amount (I hate carrying change).